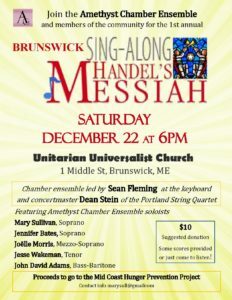 Notes: Amethyst Chamber Ensemble offers a Community Messiah Sing in Brunswick at the UU Church of Brunswick. Saturday, December 22, 6:00pm Come Sing Handel’s Messiah: Part I and the Hallelujah Chorus Celebrate the season by belting out the great tunes – and enjoy superb vocal soloists and a lovely pickup orchestra too. Bring your own score, or borrow one when you come! 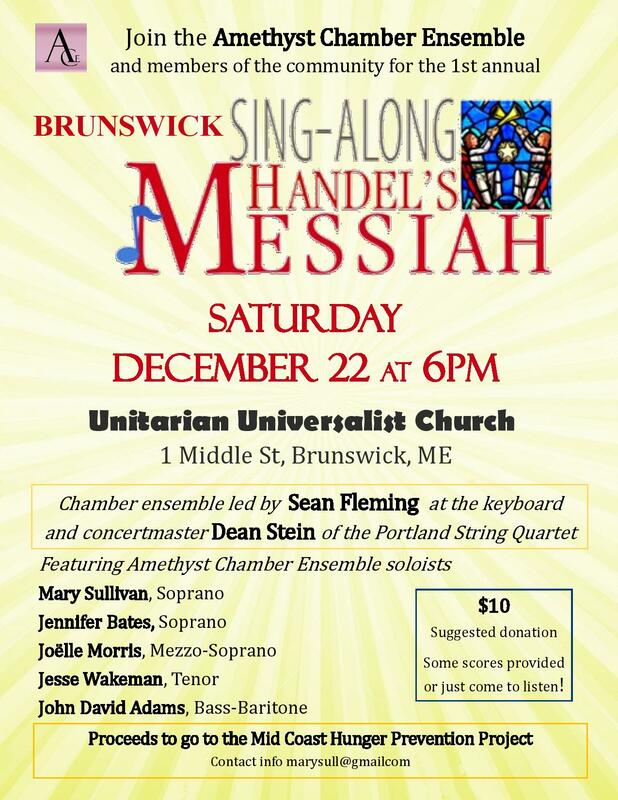 Mary Sullivan, soprano; Joelle Morris, mezzo soprano; Jesse Wakeman, tenor; John David Adams, bass baritone and Maestro Sean Fleming, conducting the players from the keyboard and violinist Dean Stein as concertmaster. Suggested donation, $10. Children and students free. All proceeds will go to the Mid Coast Hunger Prevention Project.